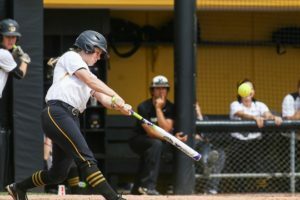 Mizzou Softball (41-14) posted its second straight shutout victory in NCAA Regional play on Friday, defeating Nebraska, 8-0. The Tigers have outscored their first two opponents at University Field by the score of 17-0. Senior Emily Crane (Troy, Mo.) sent the Tiger faithful home with smiles across their faces after clobbering a walk-off three-run home run to right field. The sixth inning blast gave Crane five RBI on the afternoon, matching her career high. Crane’s senior campaign power surge continues, as her 17th home run of the year is tied for second-most in a single season in Mizzou Softball history. Sophomore Paige Lowary (Dallas Center, Iowa) was sensational yet again in the circle, delivering consecutive shutouts to begin NCAA Regional competition. Lowary has yet to allow a run in NCAA postseason play over 11.0 innings pitched. Since May 6, the Tiger southpaw has not allowed a run in 30-of-31 innings. Mizzou’s offense was held scoreless through the first three innings of play, but broke through with all eight runs from the fourth inning through the sixth inning. In the second and third time through the lineup, Tigers’ hitters went 6-for-12 (.500) with eight runs scored, one home run, five RBI and five stolen bases. Both starting pitchers were on early, as the game’s first hit didn’t occur until the top half of the third inning. Mizzou tallied its first hit of the day in the third inning as well and threatened to score the game’s first run. With a runner on third and one out, Nebraska threw out a Tiger runner attempting to score. The Cornhuskers catcher later ended the inning, as she nabbed a Mizzou baserunner attempting to steal second base. The Tigers broke through in the fourth inning with a pair of runs. With two runners on, junior Chloe Rathburn (Mission Viejo, Calif.) produced a single and Nebraska’s center fielder mishandled the ball to allow redshirt senior Sami Fagan (Dunnellon, Fla.) to score. Freshman Kolby Romaine (Chino Hills, Calif.) entered the box next and executed a perfect suicide squeeze to allow sophomore Amanda Sanchez (West Covina, Calif.) to score. Mizzou pushed three additional runs across the plate in the fifth inning. Crane roped a two RBI single up the middle and two batters later scored herself on a throwing error by the Nebraska catcher. Freshman Regan Nash (Camden Point, Mo.) recorded her 20th and 21st stolen base of the season. The two swipes gave Mizzou four players in 2016 with 20-plus stolen bases, joining redshirt senior Taylor Gadbois (Maryville, Mo. ), Crane and Fagan. The Tigers’ eight runs scored on Friday pushed their season total to 374, the third-most runs scored in a single season in program history.